She made this herself and doesnt that look amazing..she was sweet to write out the whole recipe for me. To chop the veggies you can use BRAVO MAGIC BULLET and save time!! Mix all these ingridientts together. Make sure you use very less vinegar and hot sause. If you use too much ketchup it’ll turn out to taste sweet. Make sure you put in all ingridients according to your taste. I don’t use measurements 😦 I am not good with that. I taste the sauce and keep adding more of whatever I like 🙂 Simple as it looks!! For Flour crackers, Just mix white flour with a little bit of oil and salt and keep kneding it until nice and hard, roll it to look like a shape of a round torilla bread. 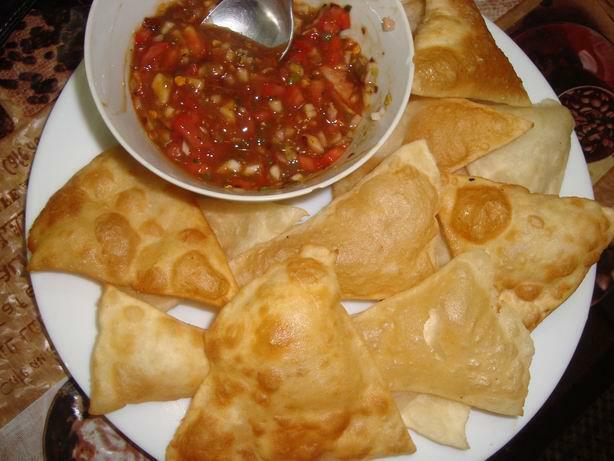 And cut it into 8 slices or 6 slices to make it look like a triangular pizza slice….and deep fry it until it’s crispy. These flour crackers can be stored in a container. This entry was posted in Everything Vegetarian, Floury Matter, Fusion, Low Cost, Magic Bullet, Nitu´s Spicy Delights, Tupperware Food, Veg Starters, Vegan and tagged bravomagicbullet, crackers, salsadip. Bookmark the permalink.